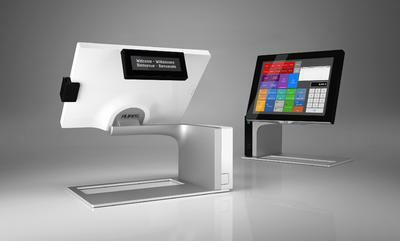 (PresseBox) (Lisses – Fürstenfeldbruck, 29.01.2013 ) The AURES Group will unveil sango, its new integrated EPOS* terminal during EuroCIS, the largest trade show dedicated to Point of Sale and Retail technologies in Europe. Designed and developed entirely by the manufacturer AURES, sango - which means coral branch in Japanese - is a completely new concept – original and innovative – an all-in-one till management systems;one of its special features is to completely free-up the space under the touch screen. “Our latest EPOS* combines purity in design and lightness, while remaining impressively robust,” explains Patrick Cathala, AURES Group CEO and founder; “the gamble of creating an integrated system where the screen would be suspended, as if weightless, was made possible by using high quality materials, cast aluminium and polycarbonate. The final impression is one of a beautiful and contemporary terminal, totally in step with current design; the space available under the screen is also a response to a number of our customers, who regret the lack of room on the checkout desk …”. Reduced to a few essential design elements, the clean open lines of the sango are emblematic of a complete and efficient management and till system (flat, fully-tilting, multi-touch LED-technology touch screen with edgeless, capacitive projected technology). With no intrusive base, stand or foot, unlike other EPOS on the market, sango soars effortlessly, as if weightless, offering and revealing a space traditionally occupied by the central unit and motherboard; elegantly attached and suspended from its offset aluminium arm, the system’s real exo-skeleton and support for its technological core (CPU), sango combines minimalist aesthetics and ease-of-use (a dedicated till drawer can be housed under the screen) – as well as lower power consumption. Sublime in the shine of the polycarbonate, sango’s seven interchangeable colours (White, Black, Red, Blue, Orange, Grey & Cassis) fit into the revolution line started by AURES in 2005 with the Odyssé terminal, bringing the final touch to the brand image and visual identity of retail chains. “sango once again demonstrates that our Group is the most creative manufacturer in the market” adds Patrick Cathala. And to conclude: “The leadership shown by AURES in innovation by design has also been recognised by the juries of the prestigious IF Product Design Awards 2013 and TOP Produkt Handel in Germany: sangois already a prize-winner in these prestigious European awards, even before it reaches the market, at the beginning of quarter two in 2013″. White, Black, Red, Blue, Orange, Grey, Cassis. The sango will be a part of Pioneer Solutions’ EPOS system range. For more information on the system, please contact us.